by Dr. Amy Yasko, Ph.D. The concept of Dr. Amy Yasko's latest book is to explain her nutrigenomic program for the treatment of autism and various chronic "adult" illnesses in laymen's terms so that anyone can understand the "why" behind the symptoms. Dr. Yasko asserts that understanding the science allows you to make specific choices for your child, or yourself, so an individualized pathway to recovery can be followed. The essence of the approach is the utilization of the latest testing to determine genetic variations (single nucleotide polymorphisms (SNPs) ) a person may have and to tailor treatment with nutritional supplements to individual needs based on this testing. SNPs commonly occur in the methylation cycle and can impact various important biochemical pathways that influence brain function, detoxification capacity, and immunity, amongst other things. 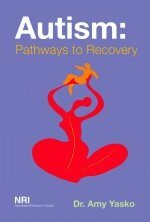 This book encompasses revised and updated content contained in the author's previous book The Puzzle of Autism including information from her Power Point presentations and the thousands of post that she has authored from her online discussion group over the years. The goal was to create a comprehensive and easily readable work that walks you through the protocol in a more organized fashion. First of all it is worth pointing out that despite the title, this book will be of great use to not only parents looking into biomedical treatment for their autistic children, but also adults suffering from multi-system (or environmental) illnesses such as chronic fatigue syndrome (ME/CFS), fibromyalgia or multilple chemical sensitivity (MCS). Dr. Amy Yasko has pioneered the use of nutrigenomics in these conditions (and others). Nutrigenomics is the individualised use of nutritional supplements to treat illness based on the patient's unique genetic weaknesses. As a ME/CFS sufferer I bought this book to help me make more sense of tests I had recently that detected a number of single nucleotide polymorphisms (SNPs) which reduce the activity of key enzymes in the methylation cycle (e.g. MTHFR & MTRR - both homozygous). The methylation cycle is vital for numerous processes in the body including detoxification and the synthesis of neurotransmitters and genetic material (DNA & RNA). Methylation deficits have been found to be common in many illnesses, including those mentioned above. The biochemistry involved can seem complex but Dr. Yasko's book takes us step by step through how each genetic variation affects the methylation cycle and the specific nutrients required to bypass genetic 'road blocks' and restore the body's ability to efficiently perform methylation reactions. For example, I have the least efficient variantion of the genes for the MTHFR enzyme which converts folic acid to it's biologically active form 5-methyltetrahydrofolate (5-MTHF). Autism: Pathways to Recovery explains that by supplementing with 5-MTHF directly, rather than using folic acid or folinic acid, this poorly functioning enzyme can be bypassed and the methylation cycle supplied with sufficient amounts of 5-MTHF to run efficiently. The book includes explanations and recommendations for all of the genes that are involved in the methylation cycle, as well as some involved in interconnected biochemical pathways (e.g. nitric oxide synthase, NOS) and provides clear diagrams that are essential for the average reader to be able to make sense of how all the various genes, enzymes and biochemicals relate to each other. Dr. Yasko and others have had much success treating patients using the methods described in this book and many individuals suffering from ME/CFS, fibromyalgia and related conditions report improvements when they address methylation issues themselves. The genomic testing for SNPs described in the book is now widely available from commercial labs and are often ordered by environmental/functional medicine physicians. Despite the relatively high price of this book $50, I would highly recommend it to help you decipher your own genomic testing (of that of your child), or if you simply want to learn more about the role poor methylation may be playing in your chronic illness.